Packing lunch for work does have a lot of benefits. It helps you save not just money, but also time. It also helps make sure that you are able to choose what goes into your lunch meal (and hopefully, you’d go for the healthier options). Bringing baon is not just for the kids! There are ways to ensure that your packed lunch looks as great as it tastes. Make your baon better by learning Bento Art. In Japan, bento refers to the packed lunch one brings along to school or work. Over the years, these packed lunches have gotten even more interesting being treated as an art form. 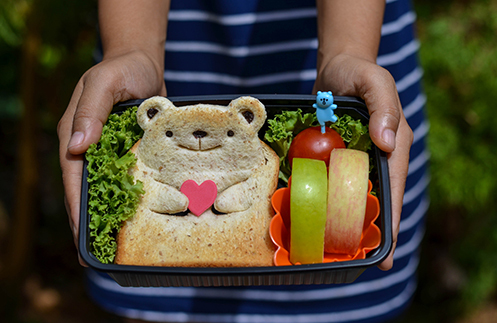 To give you an idea on how to craft your own bento box, try visiting sites like Bento Monsters and Little Miss Bento and read their articles on the art of bento. Fill your lunch box with color by picking out specific ingredients based on the way they might look once prepared for eating. Think about bright yellow corn kernels, emerald green cucumbers, cherry red tomatoes, or even the rich, dark finish of brown or red rice. In the same way that one would paint, look at the colors you have on hand and see how you can put them together in your bento box. Bentos usually come in combinations and the portions are meant to ensure that you get a well-balanced meal. If you were to break your bento lunch down into portions, try to have at least three parts carbohydrates, one part protein, and two parts fruit or vegetables. Not only will you have a well-balanced meal, this would help you keep things more interesting, what with the variations in textures and colors. To ensure that the meal you put together in the morning will still look the same when you open it at lunch, make sure that the meal is packed neatly and tightly. Especially if you’re working with a color motif, loose and abstract colors that come from a loosely packed bento lunch meal can cancel out all the work you put in. As you work on getting your much improved lunch meals together and making bento art part of your daily work experience, don’t forget one very important aspect of every well-balanced meal – fluids. Remember to always pack a bottle of Del Monte Fit ‘n Right to match the nutrition, color, and flavor your exciting bento lunch meals will now have.